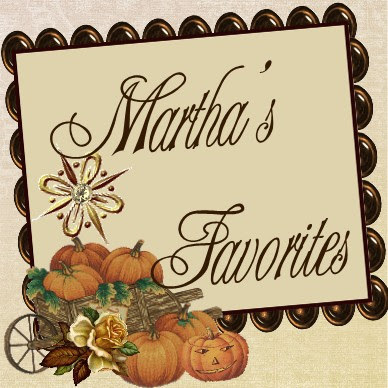 Martha's Favorites: TEA CUP VAVOOM! 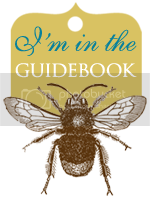 I HAVE BEEN PUBLISHED! Hello ladies! 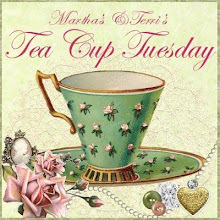 Welcome to Tea Cup Tuesday No. 106! Hope you all had a wonderful week. Thank you for your prayers, I am feeling so much better. Had a very busy week, the craft class went beautifully. Had a very large turn out which made it that much more fun. I still have not put everything back from the class. I was so exhausted, will have to start that processes today. 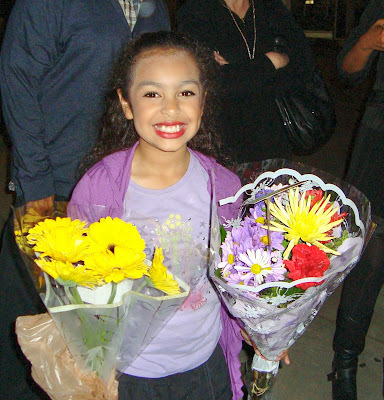 Saw Princess Maya in her first play. She smiled from ear to ear the whole time she was on. I personally think she was the best actor in the program. That's all I am going to say about that! 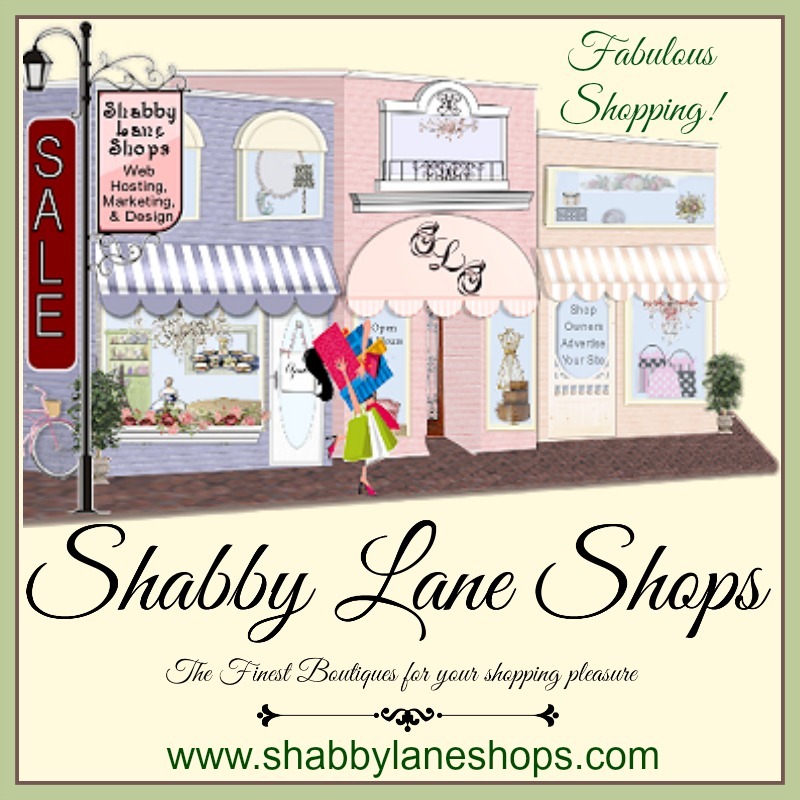 I am so happy to announce that I have been published in the Shabby Lanes Shops Magazine for this quarter. You can purchase it at places like Joann's Fabrics or Micheal's. I think that all the book stores are carrying it now. 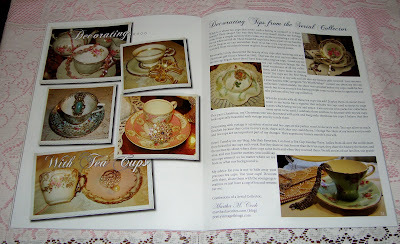 My tea cups were featured and of course, this great Tea Cup Tuesday Party! I was so excited! Have some fun cups to share with you this week. This first cup is one I recently purchased. 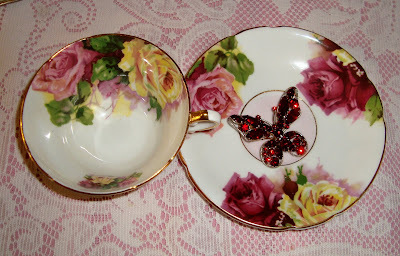 Rarely buy tea cups these days, for various reasons you already know, but I could not resist this one. It is Foley Bone China, England. The pattern name is Century Rose. Found it at a thrift store in Pasadena. It was a thrift store that looked like an antique store, but with thrift store prices. The cup is so beautiful. Love the roses that cover the inside of the cup. 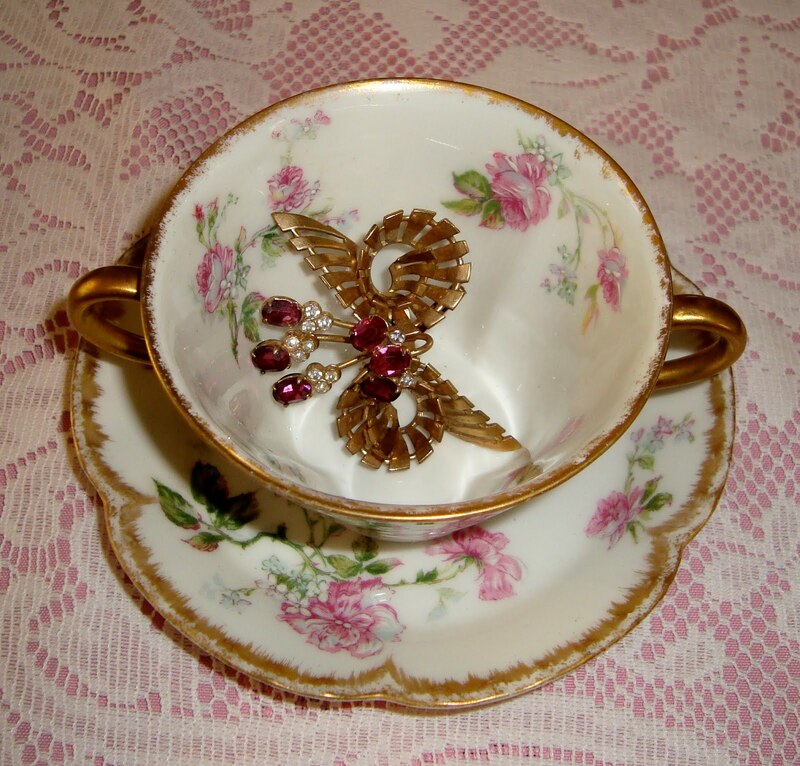 This next cup is not really a tea cup, but a bouillon cup. 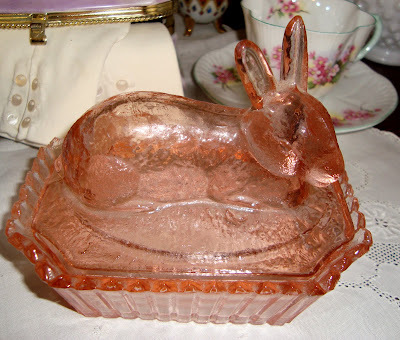 It is a Haviland, Limoges. 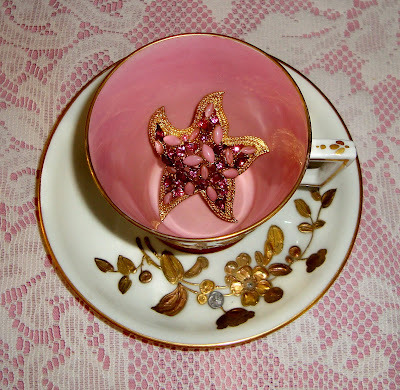 As you know Limoges is my favor tea cup maker. Just look at the design on this. The saucer is almost shaped like a small bowl. One of my favorite cups to bring out in the Spring. The small flowers are enameled, stunning! Cup No. 3 is this Stanley, from England. I love cups with extra large roses and this one feel like you can just put your nose against it and smell the flowers. This next cup is Lusterware. I would guess it is Made in Japan, although unsigned. I collect portrait cups and just fell in love with this one a few years ago. It is not really a high quality cup, it's just beautiful to me. I picked this one up for $1.49 and I love it! The last cup is a Stroke on Trent, Point One, from England. 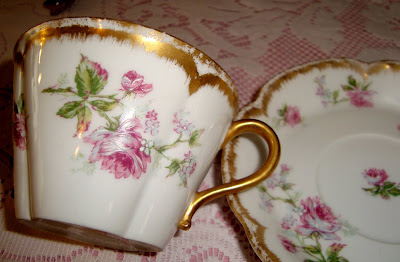 It is very delicate china with a heavy gold and silver leaf design. Just look at that handle, It really does not photograph as beautiful as it really is. I am so glad you could join us again this week. Here is our Linky. Terri as usual has a beautiful cup to share with us. Please visit her, when you get a chanceI want to end with a picture of Sophia and Noah. She is sitting in a high chair, eating food already. What happens to time? I keep reminding myself to take in every moment I can with them, they grow up so quickly. When you are young and raising your children, you do not realize this. I try to tell Vanessa to take it all in while she can. Time just moves so fast. Have a wonderful week. 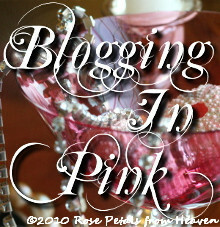 Remember I give discounts to my followers are all the items I sell on my website http://prettyvintagethings.com/. 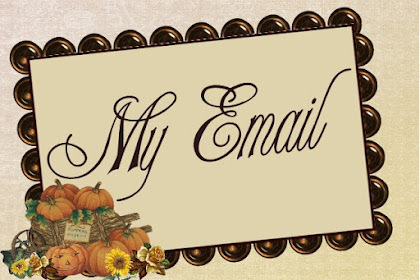 Just send me a note. You most CERTAINLY should be in "All the magazines". You are so amazing!!! Love the pictures of your "Little Sweeties & the Princess". Oh yes time does FLY!!! "Squish them GOOD NOW, because soon they'll be teens and TOO COOL to be hugged". I'll have to HUNT DOWN your magazine! 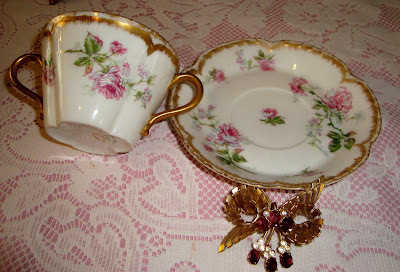 Another lovely set of teacups! Congrats on the magazine! wow, Martha, congrats on your newest publish - that's GREAT news! 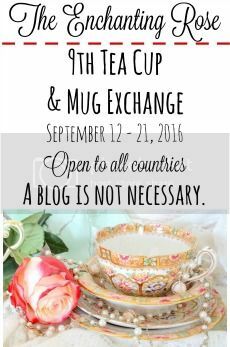 And your post and newest teacup - absolutely gorgeous. All your teacups are beautiful - but nothing is quite as beautiful as the pic of those sweet grands. Priceless! You are SO RIGHT about time, and when younger not knowing the value of it - especially with babies. ah, the wisdom of age. Congratulations. It is great to see the pictures from the magazine of YOUR teacups. I am guessing you are thrilled too. Congratulations Martha you must be thrilled to have an article in a magazine, that is really great. 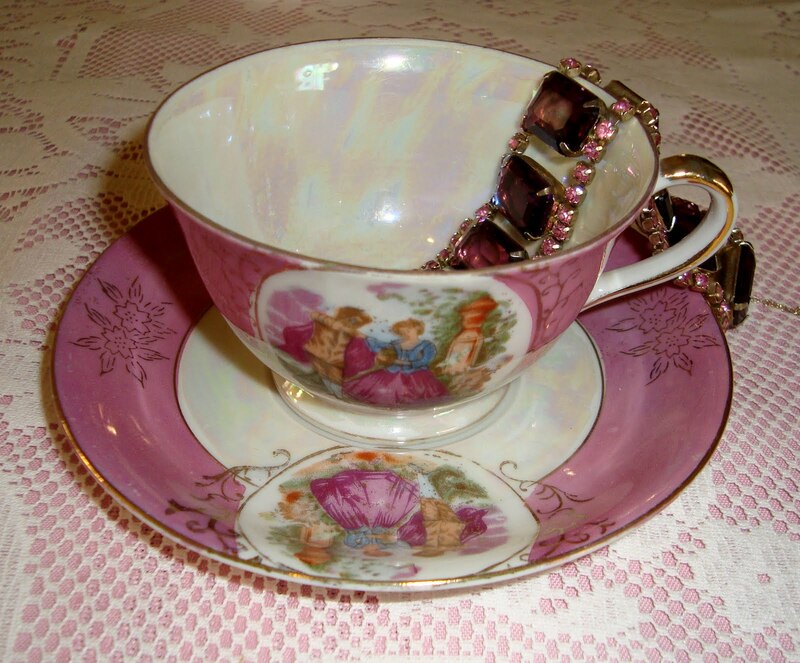 As usual you have so many beautiful teacups. You must be so proud of Princess Maya and how sweet your grandchildren are. Oh Martha! You spoil us today with the most gorgeous selection of tea cups! Each one is beautiful, and I couldn't pick a favorite. The cups with the large roses are really something special! I can see why you love them so. Noah and Sophie are adorable, and Maya looks so pleased with herself, and for good reason : ) I am sure she was the best in the play! Congrats on being published!!!! A lovely display of teacups as usual!!! Congratulations, Martha! You have so many lovely tea cups and you display them beautifully. Congratulations, Martha! How exciting! Your teacups are so lovely. I especially love the roses! 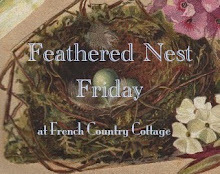 Thanks for sharing and enjoy your day. How exciting ... published!!!! Love your teacups and bling, but especially like the pink rabbit! Happy Tea Day! Hi, Martha. i really love your post today and congratulations on the magazine!! I can't wait to get a copy. There is a Joann's Fabrics near me. I'll have to take a look. I'm so happy for you. You Princess is delightful! She has the most beautiful smile and I know you are very proud of her...and so you should be. I bet her performance was simply wonderful! Your tea sets once again are GREAT! I do love the one with the bigger roses. I am finding these more and more attractive. 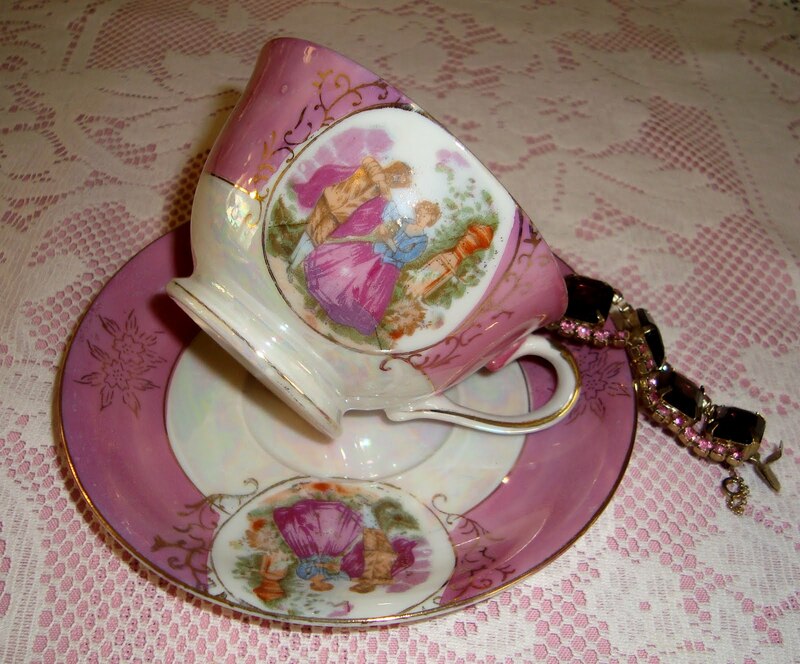 Your portrait cup and saucer are just so beautiful. Such a great find. I just can't believe your Sophia is already eating foods. It wasn't that long ago when you announced she was born. And I always love seeing little Noah. These children sure bring a smile!! The photo is so cute of them! You are right about how time flies. 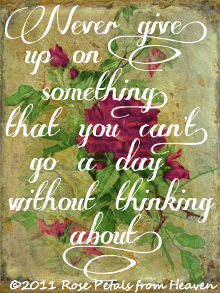 Hold on to every moment and make lots of memories! I look forward to your Tuesday post all week Martha. The Stanley is my favorite this time, although, as usual you made it very hard to choose. I have been studying different shapes of cups, and the evolution of teacups. You have such a variety today I was able to test myself. Your Little Miss looks like she had a splendid time. Your grandchildren are blessed to have such an involved and supportive grandmother. how exiting to be featured on this magazine. Thats a nice tribute to your outstanding collection and to an amazing woman. 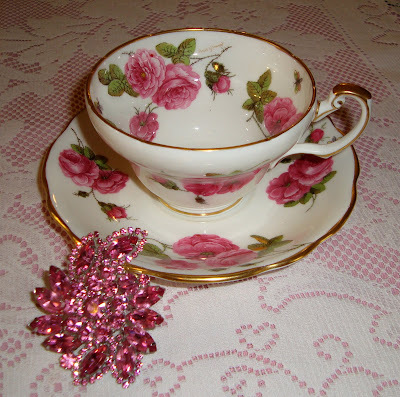 Your Foley Bone China cup with roses is great. I would have bought it, too. Oh my, time is running so fast. The children are growing. They are both so cute. Thank you for sharing the highlights of your days and for hosting this sweet event. Martha, congratulations!! it's wonderful that you are in print!!!! your little darlings are all so adorable!! and your little princess is looking wonderful and excited after her performance!! Love that smile!!! Oh Martha. I'm going to try to find that magazine here in Massachusetts. I'm so thrilled for you. Now I know a famous person! Your little grandchildren are so adorable...Oh! That baby girl. What a little sweetheart. Congratulations Martha! 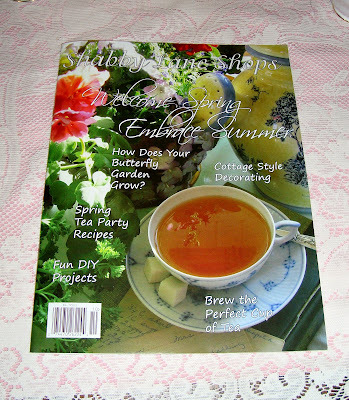 What a wonderful magazine. I will be picking mine up at Micheal's. Thanks for sharing. 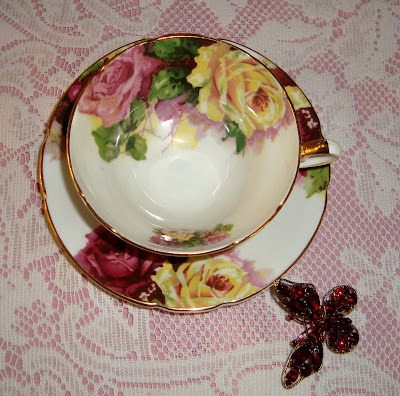 Your teacups are so lovely! Have a wonderful week. I don't think I've been to your blog before, but what a fun day to show up. Hearing your good news, and seeing all those delightful tea cups just made my day. P.S. 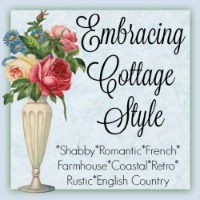 I popped in after visting with Susan at "Writing Straight from the Heart." Martha your teacups are all so lovely. I can see why they were featured in the magazine. Congratualtions and you so well deserve this honor. I am so thrilled for you. Your grandchildren are SO precious. I can see why they give you so much joy. Grandkids do that don't they. I have 34 and each and everyone is so speial to me. What wonderful blessings we have as grandmothers. 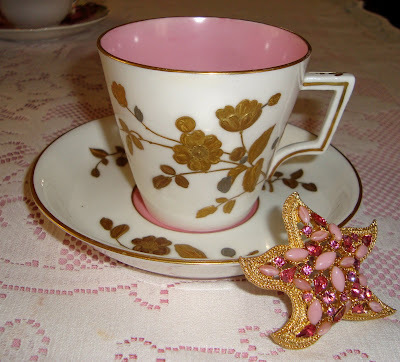 You have such a charming blog and it has brought back so any nostaligic memories of my mothers tea cup collection growing up. I treasure the few that I have. Congratulations on your success Martha! Your cups are to die for. Thanks again for sharing them with us. Also hope you are totally back on your feet soon. Congrats!! 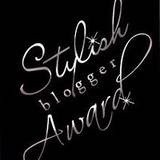 You so deserve it!! 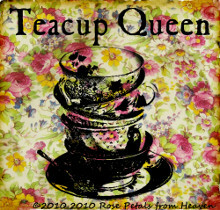 Love all of your tea cups as usual! And your grand kids are so cute!! Adorable grands and the Princess Maya in her debut...children are so adorable, wish we could stop time for a good many years before they become teens..but I guess we'll ejoy them than too. You deserve to have your tea party published, wow! Terrific Martha! Thank you for hosting again and HAPPY EASTER. Congratulations, Dear Martha, for being published! How exciting that must be. Lovely pictures and those children! So adorable. You always show such beautiful treasures, but of course your greatest treasures are your grandchildren. 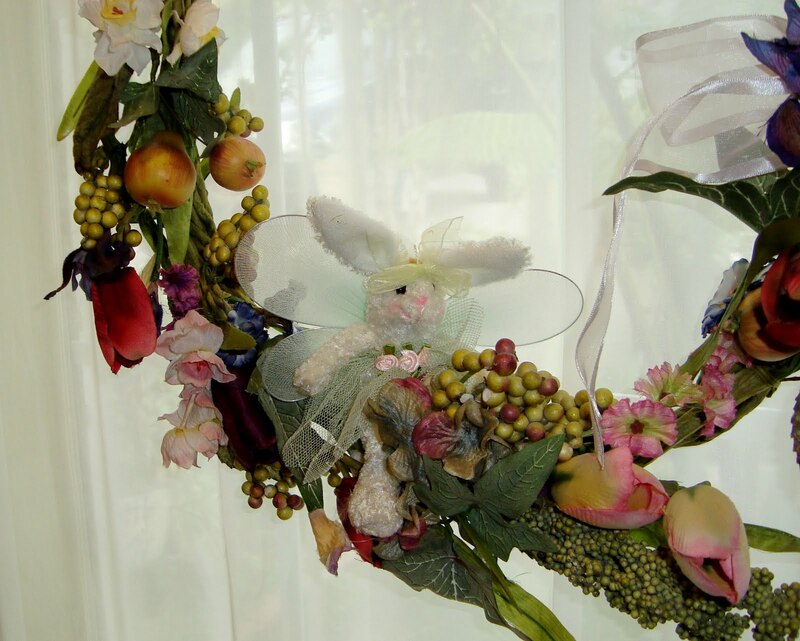 Wishing you a very Happy Easter, and may it be truly Divine.